[Extract] Australian studio Biasol sought to preserve the art deco elements of this warehouse in Melbourne while converting it into a shared studio and office space. 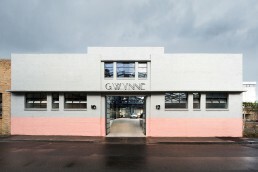 The Gwynne Street Studio is located in the Cremorne suburb of Melbourne – an area that Biasol describes as having a “creative and industrial past”. To read the full article by Alice Morby click here.